It’s tough to find a decent pair of full-size, closed headphones for under US$50. they’re generally pretty painful, in terms of both their fit and the sound they produce. The HD 202 are clearly an exception to that rule. Not only do they sound good, but with good padding on the headband and earpieces, they’re also fairly comfortable (if a bit bulky for portable use). 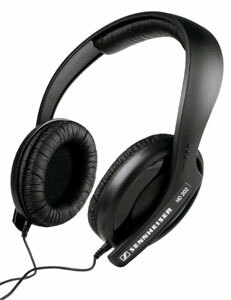 I’ve been sporting a set of sennheiser HD 495’s at work for about the past 4 years. They are open ear (because I don’t like being startled by people trying to talk to me in the office and the background noise in here isn’t that bad anyway), but for your use closed ear sound like the go. Overall A++ : good sound, very comfortable, not too dear. The connection to the right side has just started to go (cuts in and out unless there is some strategically placed blu tak), but they have gone the distance pretty well considering I use them almost all day everyday. I’ve been a happy owner of the same model for an year or two and am fully and one hundred percent satisfied. I can’t really tell what one should expect of really good headphones but these suit me down to the ground (I usually listen to 192kbps ogg files and wouldn’t be able to tell the difference between digitilized music and audio one so don’t make me a judge here); they completely block external sounds and from time to time co-workers have to wave or poke me even for I can’t hear what they say. If you want to feel yourself separated from the surroundings and pay no too much, it’s the choice, I’d say. I bought some HD 202s a few months back after getting tired of a cheapo pair and yearning for a bit of bass. I tried out the HD 202s at JB. Actually, I had my minidisc on my belt and I was able to try them on that and they were great. I’m over 40 and my hearing is not as precise as a young person but these phones were ideal for me. When I got home, my showed them to my son and he immediately decided he wanted a pair and he got some for his birthday. My daughter is now asking for a pair for Christmas. I have a keyboard/piano in my living room but recently my family started to watch excess amounts of tv. I’ve found it extremely difficult to learn new songs so i bought the hd 202. They are great; the clarity of the sound from my piano is much better with the headphones and they cancel out all other noise. I especially love to listen to music with them.